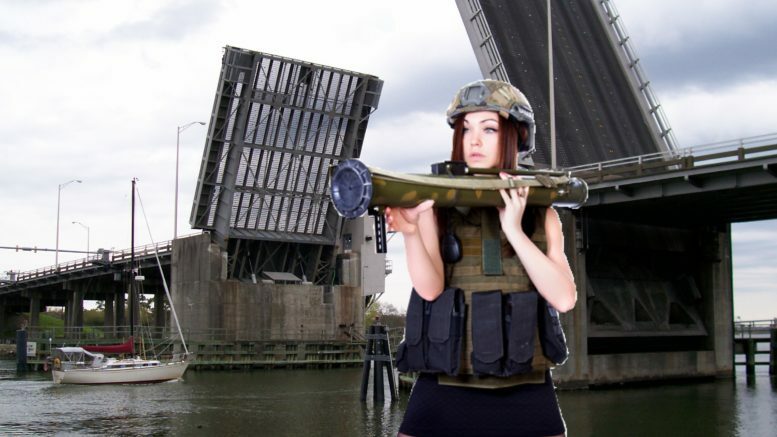 Tensions boiled over on James Island yesterday when a group of frustrated drivers decided to fire a Rocket Propelled Grenade (RPG) at a large, slow-moving sailboat that kept the Wappoo Creek Bridge raised for fifteen minutes, halting all traffic coming in and out via the bridge. Earlier this spring, the James Island Boat Haters Organization (JIBHO) voted unanimously to create an initiative to fight back against the influx of ridiculous sail boaters who regularly stop the flow of traffic. The raising of the bridge has been a source of frustration for JI residents and visitors alike for decades. Even though the Wappoo Creek Bridge doesn’t raise during common rush hour times, it still screws over many James Island residents with non-traditional working hours. Stranded drivers can routinely be seen punching their steering wheels while they have to wait for a pretentious dude in boat shoes and seersucker shorts to maneuver his unnecessarily tall boat through the raised bridge. Doris Nyman was the one who fired the RPG at the sailboat. “When I saw the gates come down and the bridge raise, I knew it was go-time. We’ve been doing dry runs since we voted to fight back,” she said. “As soon as I had that big dumb boat in my sites, I fired and nailed it. Ka-Boom! We’re going to take them all down…one by one.” When asked where she acquired an RPG, she said she bought it off some dude in North Charleston. A recent video featuring an anonymous person in a Barbie mask was sent out to all members of the yacht club via email. “Speed up or pay the price. We don’t care about your boat,” it stated. 6 Comments on "Angry James Island Drivers Fire RPG at Large Sailboat That Raised the Wappoo Creek Bridge"
Too many unnecessarily tall boats!! I hope she went to jail for attempted murder. Is this true? ?